We’ve been having two bedrooms repainted and refloored over the past six weeks. We had planned to have the old, ratty, who-knows-how-old-it-is carpet removed and replaced with Pergo(R) (that fake laminate flooring that resembles wood). However, we got a big surprise when they pulled up the carpet in both rooms and found old, rolled-up linoleum that wasn’t glued down. And, under the linoleum, they found a layer of old newspapers in excellent condition. The one I picked up was the front page of the Bangor Daily News from September 22, 1953. 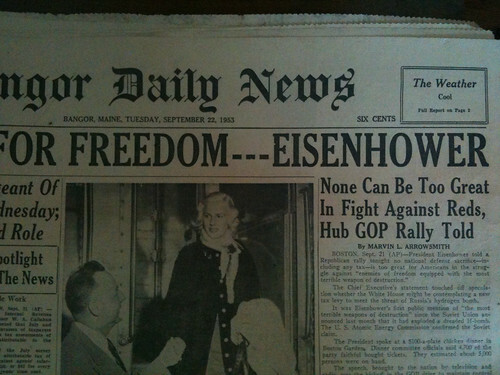 Eisenhower was in the headlines. That was pretty cool. Even cooler was the beautiful, albeit old wooden floor that was underneath! We had a craftsman come in and sand the floor down, even out the nails, and then stain and coat it. The floors in both rooms are breathtaking now and we saved over $1,000! The kids’ godfathers came to visit last week and we had a large family dinner outing one night. Max really liked the steak so we told him to tell the waiter so the waiter could tell the chef.